It was a cold, rainy December morning in Vancouver when paramedics spotted a woman in wet clothes, looking out of place at a bus stop. Kathryn had been missing for 27 hours by then. Her daughter had dispatched a small army of friends to look for her after she failed to come home from her walk the previous morning. “It was brutal. I thought she was dead. The paramedics brought her to the hospital and they admitted her,” recalls her daughter, Katrina, who lives in the same building as her mother and is her primary caregiver. Kathryn, 67, has frontotemporal dementia. It was not the first time she’d gone missing. Two weeks before, she was found after a customer at a gas station called police when Kathryn wandered in to use the bathroom. “People with dementia tend to walk in straight lines and just keep going,” says Katrina. When Vancouver police called her in January 2017 to ask if she wanted to sign up for the MedicAlert® Safely Home® service, she immediately said yes. The service is offered in partnership with the Alzheimer Society of Canada as a way to help people live as safely as possible in their communities. 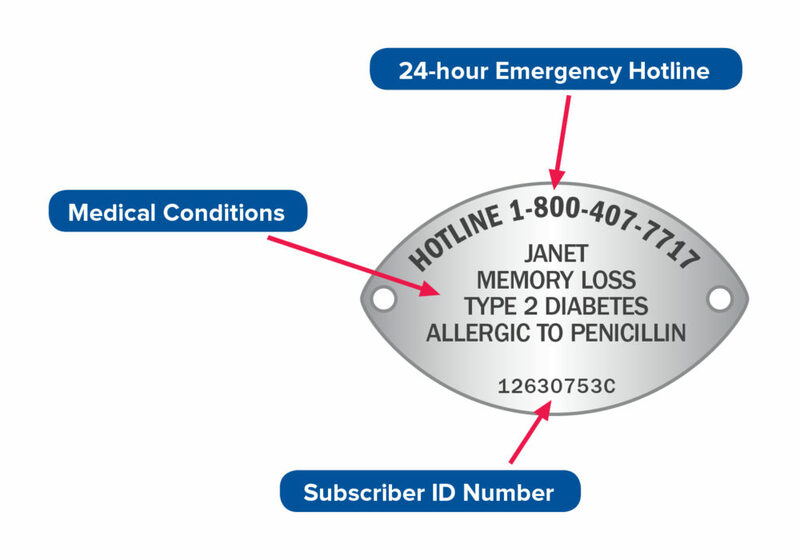 Subscribers wear a blue bracelet with an engraving indicating they have memory loss and a 1-800 number staffed 24/7 by emergency hotline specialists who notify caregivers. Hotline specialists also have access to the subscriber’s photo, physical description, vital medical information and locations where they might be found. Her mom has not gone missing since Katrina gave her a MedicAlert Safely Home bracelet, but she still keeps close tabs. “Registering my mom with this service is peace of mind for me,” says Katrina.